Residential Real Estate Investment for Excel is a professional purpose built Excel spreadsheet that calculates and details the profitability of any residential real estate investment. Input the detailed property data and the model calculates positive and negative cash flows, estimates profitability and break even, and determines investment value using discounted cash flow, cap rate, and IRR methods. Includes seven detailed worksheets and in depth user manual. A detailed 26 page instruction manual describing every input, calculation and concept used in the model. Accurate break down and calculation of the potential profitability of any residential real estate investment in a single Excel valuation tool. Every detail and calculation is already built and tested. Input and analyze all revenues, expenses and cash flow inputs. Flexibility of model including hundreds of revenue and expense categories and multiple valuation methods to choose from. 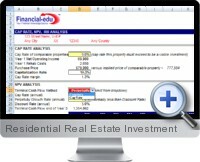 Residential Real Estate Investment for Excel requires Excel 2003 or higher.